Are you considering making a thinking of you card for a relative or someone who is familiar with your family? 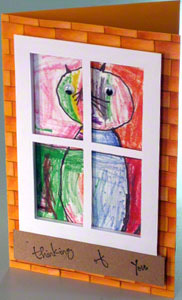 Then, using your child’s art for the greeting card, is a great idea. Don't have a similar art that suits? 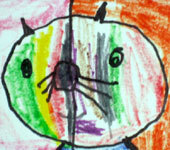 Then feel free to download this cat art which my little one created in school. Needless to say, "cat in a bag" and "cat in the hat" are common expressions today. And you'll find them in greeting cards too. But, here’s the first "cat in a window" greeting card - I believe. And it has a "thinking of you" feeling about it. Hence, the inspiration for the card. Apart from this, if using your child's art, then feel free to transform the art to suit the card. This might include enlarging or reducing it using a copier, printer, or other devices. For example, for this project, in comparison, the actual art is 8.5” x 13” which is larger than the 3.5" x 5.5" card window. This leads to the age old debate of whether the printed piece is still a greeting card art or if it’s now a greeting card graphics because it came out of a machine. But that discussion is for another day. 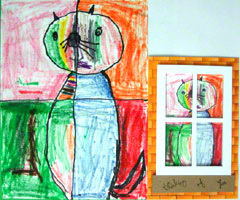 By the way, in case you missed it, the cat in a window expression truly belongs to the little artist. Because, he actually put the cat in cross hairs without realizing it. In truth, there is a sad "missing you" composure to the whole art - even though the cat is actually smiling. Ironic isn't it? Score and fold the mustard 8.5” x 11” cardstock into a 5.5” x 8.5” card. Draw and cut out a 3.5” x 5.5” window with a 2” bottom margin and 1” margins for top, left, and right. Cut two ⅜” x 4.25” foam board strips, two ⅜” x 5.5” foam board strips, and one 0.75” x 4.75” foam board strip. It’s difficult to cut foam boards without leaving jagged faces. This does not usually matter if the foam piece is fully hidden behind another material. However, in this window opening, the faces are visible. Hence, instead of carving and re-carving the strips to get a cleaner cut, simply cover the jagged face with a strip of paper. Glue the 0.75” x 4.75” foam strip about ⅝” from the bottom of the card. And glue the remaining four foam strips around the cut out window. Use the colored pencils to create the brick wall art on the mustard cardstock. The bricks are 0.5” x 1” approximately. Hence, each brick row is 0.5” high. On the 4.5” x 5.5” white cardstock, cut out the 4 rectangular holes such that the outside margin is 0.5” and the center cross-hairs is 0.25” thick. Glue the white cross-hair window on the foam board window strips. Use the rubber stamps and black ink pad to stamp out “Thinking of You” on the 1” x 5” brown cardstock. 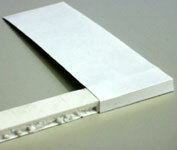 Glue this brown cardstock on the 0.75” x 4.75” foam board strip to create the window sill. If necessary, shrink or enlarge the cat art to fit the 3.5” x 5.5” window. The cat art via this link already has the correct size and it's free to download. 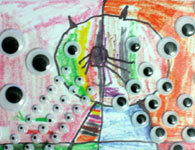 For added animation and fun, glue the preferred size of puppet wiggly eyes on the cat. Finally, glue the cat art on the thinking of you card behind the window. This marks the end of the thinking of you card making procedure. The next step is to make at least two people happy: that wonderful person who’ll receive the card and the awesome card creator that's putting it all together... you.